SSD Drive Characteristics – cont. This is part 2 (finally) of my experiment with using an SSD as my main drive for my laptop. 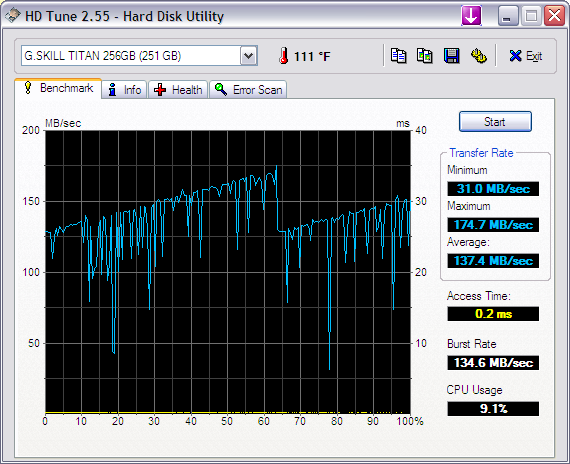 If you want to read part 1 first, go here SSD versus 7200rpm Drive. In this installment I wanted to share with you some telling charts about the characteristics of an SSD drive. As you may know, SSD drives have great read access times. It’s almost instantaneous as you don’t have to wait for a mechancal drive head and the spindles to spin up. Here I have 2 charts that show read and write times for two 256G drives. One is a fast 7200rpm mechanical drive and the other is the GSKILL SSD. The program I used basically exercises the entire drive and records the time to read and write to each sector. Here’s what each of the lines mean. Yellow Dot – Read times across the drive. Let’s analyze this first chart. As you can see, it’s very linear and predictable. As we move farther out in the drive sectors, the access times slows down a bit. Similarly, the read times increase (yellow dots) over time as we get farther out in the drive. The SSD drive is a bit erratic, but read times are great! In this chart we see a lot of weird behavior. The blue line shows that while mostly fast, there are time when there’s a drastic drop in the transfer speed of the drive. It seems to be consistently slow at set intervals. I beleive this is the “stuttering” problem that you may have heard of as the drive controller get overloaded. Although normally very fast at 100MB or more, there are several times where it drops down to the 50MB and less. This is worse than the mechanical drive at these points! However if you look at the read times (Yellow Dots) you can see that reads are instantaneous. In fact, you may have missed the dots as then are all along the x-axis at the bottom. The average access times are under half a mili-second! That’s pretty much instantaneous to us humans. So there you have it. Proof positive that this particular SSD is not going to be the overall excellent performer when compared to a fast 7200 rpm mechanical drive. In the end, I sold this SSD and went back to a standard drive. I hear that the Samsung and Intel drives have remedied the problems I see here, but at $800-1000 they are not going to be in my laptop anytime soon. I will wait until they drop to about half that, and then I’ll do this all over again.